Below are directions on how to get to America Square. 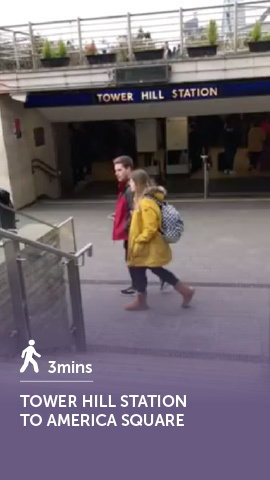 We also recommend the TFL Journey Planner to help you get here on time. To reach America Square Conference Centre on foot maps and directions can be found on walkit.com. Just enter your start location and our postcode: EC3N 2LB for the best walking route. Tower Hill (District, Circle and Docklands Light Railway) – 3 min walk – On leaving Tower Hill tube station walk up the steps and turn left. Shortly turn right to be walking away from the river and the Tower of London. Continue along this road which is Cooper’s Row towards the railway bridge. Immediately after the bridge turn right onto Crosswall and America Square is on your right. Enter at the revolving doors and turn right for the entrance to the venue. 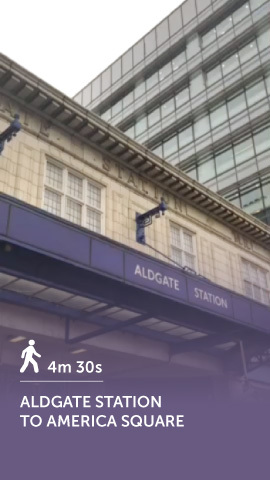 Aldgate (Circle and Metropolitan Lines) – 4 min 30 sec walk – On leaving Aldgate tube station cross the road then turn right towards the “Walkie Talkie” building. Take the first left down Minories and cross the road at the level crossing. Continue down the street and when you reach the traffic light crossing, cross the road and turn right down Crosswall. You’ll get another glimpse of the “Walkie Talkie” building ahead but at the first junction you’ll see the America Square building. Cross the road and continue straight ahead down the side of the building and enter at the revolving doors. Turn to your right for the entrance to our venue.